Golf, tennis, vineyards, horseback riding, a spa and more by the Andes…. 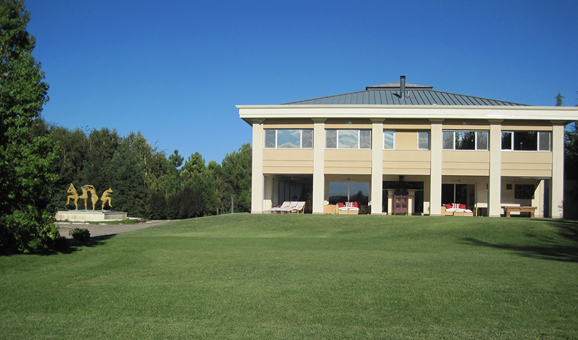 This is the ultimate Uco Valley Vacation lodge: golf, tennis, horseback riding (into the nearby Andes) on 790 acres, with a wide open natural reserve on one side, vineyards as far as you can see, a lagoon and a spa. The hotel, designed by the architect father of the owner, has an organic roof garden and sun decks. 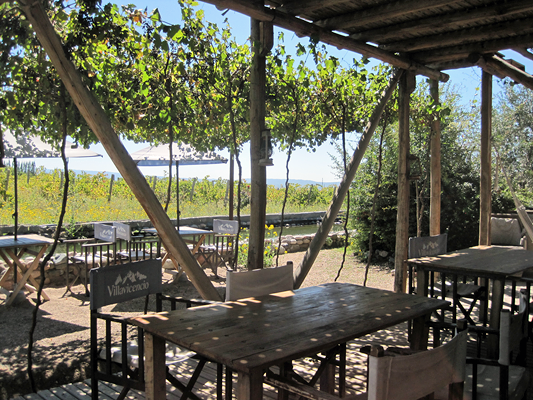 Rooms open on to lagoon or the vineyards, and you can dine in an elegant restaurant, at the casual “quincho” (Argentine outdoor bbq) or at a special table set up in the vineyard. Sip and sleep when the sun sets behind the Andes…. In this modern adobe structure with five rooms (each with a hammock on its veranda), guests gather in the evening on the roof of Alpasión for sipping while the sun sets behind the Andes. It’s remote setting could be a plus or minus, depending on your personal tastes. An unusual amenity is the fun kid-friendly suite with bunk beds. Award-winning wine, produced on the premises, is served in the wine bar. This gracious country estate, with huge bedrooms, a second-floor library that houses 8,000 books and 2,000 DVDs, feels like home. Cocktails and dinner served outside on the veranda, followed by dinner in front of the fireplace. Stroll around the premises and admire the sculptures. Go beyond the swimming pool, through the rose garden and into the vineyards. Plan with guests or staff a visit to nearby wineries. High on a slope overlooking the Uco Valley, this may be the closest thing to sleeping in the middle of a vineyard-with all the comfort and conveniences that the owner/architect can provide. Don’t miss: the under-water view of the wine cellar. After you’ve toured the nearby bodegas (Atamisque, Andeluna, Altus, Salentein), enjoy lunch under the thatch roof by the pool, or in the cozy wine-bar/restaurant. Fresh ingredients from the garden complement an imaginative array of appetizers-mini-brochettes, quesadillas-main course changes daily, dessert might be fresh srawberries on a cookie, creme brulee or lemon mousse. -so after a siesta and a stroll in the vineyards, you’ll find bread, cold cuts and cheeses delivered on a tray to your room–and a fire in the fireplace.